The item Are these my basoomas I see before me? 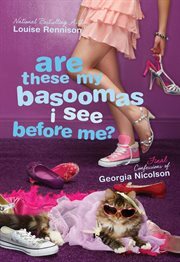 : final confessions of Georgia Nicolson, Louise Rennison represents a specific, individual, material embodiment of a distinct intellectual or artistic creation found in Evansville Vanderburgh Public Library. For Georgia, the more things change, the more they stay the same. Just when she thought she was the official one-and-only girlfriend of Masimo, he's walked off into the night with the full hump, leaving Georgia all aloney on her owney-again. All because Dave the Laugh tried to do fisticuffs at dawn with him! Two boys fighting over Georgia? It's almost as romantic as Romeo and Juliet... though perhaps a touch less tragic. It's time for Georgia to get to the bottom (oo-er) of this Dave the Laugh spontaneous puckering business once and for all. It's like they always say: If you snog a mate in the forest of red bottomosity and no one is around to see it, is he still a mate? Or is he something more? </p?